What Day Of The Week Is July 10? 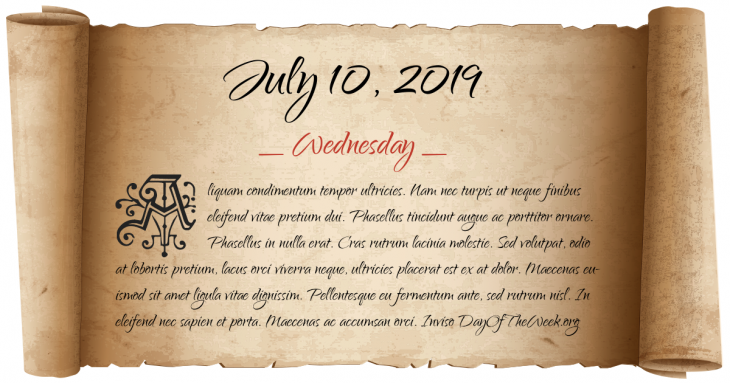 July 10, 2019 is the 191st day of the year 2019 in the Gregorian calendar. There are 174 days remaining until the end of the year. The day of the week is Wednesday. Richard Neville, 16th Earl of Warwick defeats the king’s Lancastrian forces and takes King Henry VI prisoner in the Battle of Northampton. The then-villa of Mayagüez, Puerto Rico formally receives its city charter from the Royal Crown of Spain. Hungarian hyperinflation sets a record with inflation of 348.46 percent per day, or prices doubling every eleven hours. Maurice Couve de Murville becomes Prime Minister of France. John Paul Getty III, grandson of oil magnate J. Paul Getty, is kidnapped in Rome, Italy. World News Tonight premieres on ABC. Alexandra Palace burns down for a second time. EADS, the world’s second-largest aerospace group is formed by the merger of Aérospatiale-Matra, DASA, and CASA. Hurricane Dennis slams into the Florida Panhandle, causing billions of dollars in damage. Russian cruise ship Bulgaria sunk in Volga near Syukeyevo, Tatarstan, leading to 122 deaths. Who were born on July 10?